Podcast #233 – We Have Chickens! It’s probably been more than two years ago that we started talking about introducing chickens to our little subsistence farm. Yet somehow we always let other priorities shove them aside. No more. 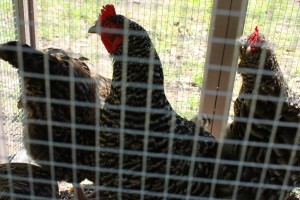 Yesterday we finally brought home four pullets – crosses between Plymouth Rock and Ameraucana– and they immediately settled in to life in the little coop we provided for them. The birds themselves are fine. Having lived together for a while, they had already developed their pecking order, so there was no need for the usual dust-ups that accompany the building of a flock. We hope very soon to allow them outside to enjoy some of the grass and bugs available on the orchard floor. The big challenge is Oddie, our springer spaniel, who obviously has a powerful instinct to attack them and probably to eat them. It’s frightening to see this gentle creature we’ve always regarded as a welcome companion become so determined in his ferocity toward the defenseless birds we’ve brought into his life. The four young hens have settled into their new life quickly. Soon we hope to allow them to free range on the orchard floor. Previous Previous post: Podcast #232 – What Does It Take To Be a Subsistence Farmer?